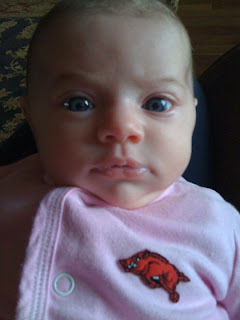 The Mizell's: Brynn Bradley recently!! 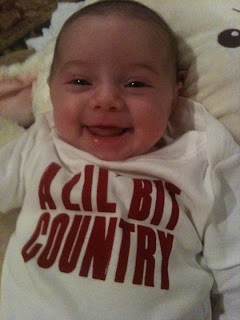 Brynn has been such a fun and easy baby!! Even when she wakes up during the night Amber says she just coos and smiles!! Laci, Megan, & Brynn continue to fill my heart with more love every time I see them!! this baby girl has been stylin since she was born, Amber always has her dressed so cute!! 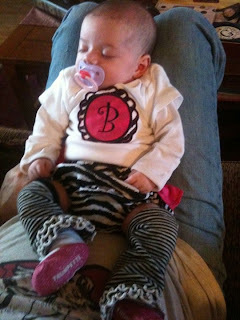 Brad, her daddy found this outfit @ the Baptist gift shop, she has camo boots to go with it!! 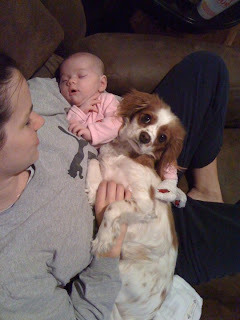 I kept Brynn while Amber took the two big girls to gymnastics.. apparently I was babysitting Charlie too!! so comfy in her auntie's arms!! We're still trying to figure out who she looks like.. any ideas?? We've gotten Wes recently and many people say me.. I think that's because of her dark features. 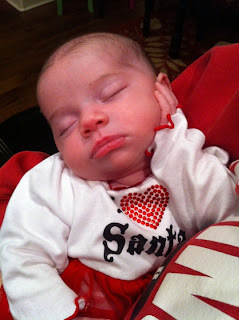 Like her sisters, mommy, & nonny, I think she's going to have those baby blues! !